iDid: Location Sharing : iDid Inc.
Share current trip: With this you share your location with your friend till your current trip ends. Note that trips are not just driving but also visits. If you are driving to meet a friend you can share using this option and your friend will know where you are and how long it might be before you get there. If you are in a place and want to ask your friend to meet you, you can use this option as well (even though you are not moving). With location sharing, you also get contact information and driving directions/navigation to the person. Using “Alert”, you can set proximity alerts, so you are notified when the person is near you. Share for the next hour: Regardless of your current activity, this will share your location with your friend for the next hour. Share till you meet: Convenient way to temporarily share location with your contact till you meet him/her. Share forever: This option is useful for a permanent sharing agreement. Note that this is persistent across restarts of the app and reboots of the phone. With iDid you can share your current location and movement within the context of a trip. To use the sharing function, select “Show Map” and “Start Sharing“. It takes you to your Contacts screen where you can pick the contact you want to share with. Then choose from the following options and “Share“. Share current trip: With this option you share your location with your friend till your current trip ends. Current trip can be a drive, a place you are visiting or even a flight. Your location and location updates are shared with your friend till the trip is done (you leave the place, stop driving or flight lands) after which sharing is automatically stopped. Share for the next hour: Regardless of your current activity, this will share your location with your friend for the next hour. You can transition between activities in this period and sharing will continue. Share till you meet: Your location is shared with your friend’s till you and your friend meet. Sharing continues regardless of activity changes till you meet your friend. This is ideal when you are waiting to be picked up at the airport or driving to meet a friend. Share forever: This option is useful for a permanent sharing agreement. Note that this is persistent across restarts of the app and reboots of the phone. This is great for family location sharing. Additional automatic context based sharing modes are supported and will be discussed in subsequent posts. To receive location updates from others make sure you turn on “Receive Trips” in your Settings. To find the location of a person who is sharing with you, select “Locate Friend” and then choose your friend from your contacts. If your friend is not sharing location with you, you can send a request to share location from the app itself. 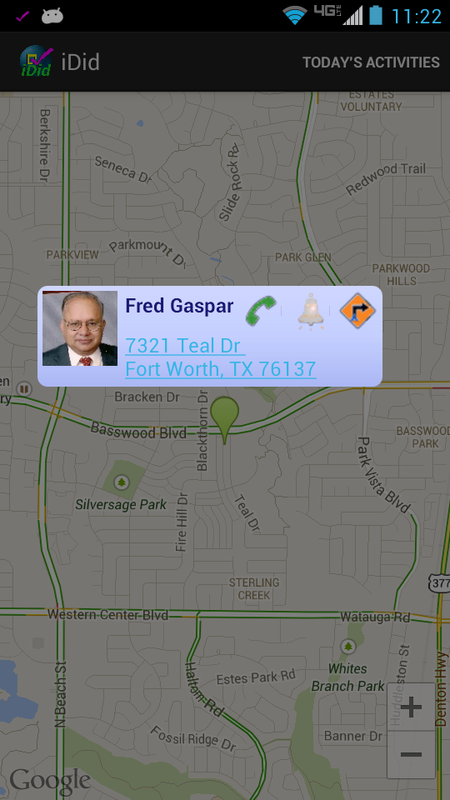 Clicking on your friend’s marker on the map brings up a pop-up with three options: Call, Alert and Drive. Use “Call” to bring up your phone app and call your friend. If someone is sharing with you, you can call them even if their phone number is not in your contacts. Use “Alert” to set up proximity alerts as described here. “Drive” supplies the location of your friend to your navigation/driving directions app, so you can drive to your friend’s location.